As mentioned in one of my previous posts, I have been working with Nākd to create some delicious and healthy recipes using their bars. 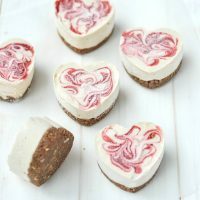 Second up, I am sharing my individual strawberry cheesecakes which are nearly completely raw, 100% vegan and gluten-free. 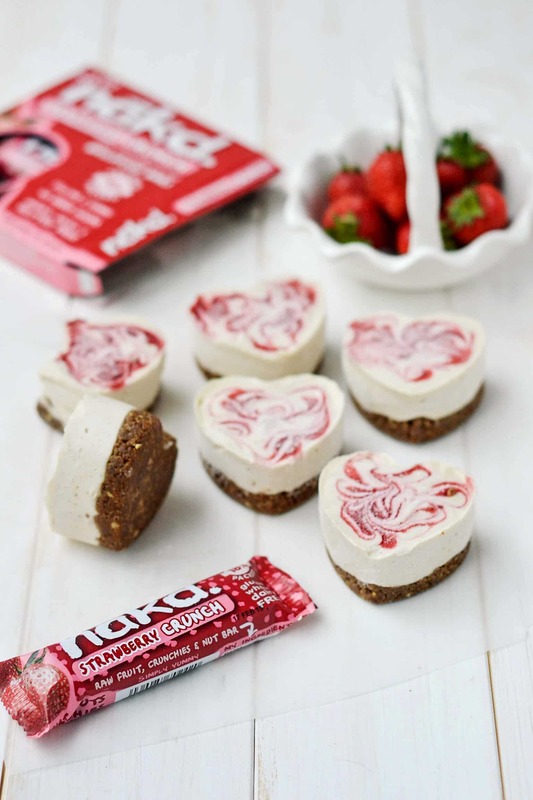 The cheesecake base is made up entirely from Nākd’s Strawberry Crunch Bar which has a wonderful crunchy, chewy texture and adds an extra zing of strawberry flavour to the cheesecakes. These are so delicious, creamy and indulgent yet virtually guilt-free! Perfect served as individual desserts for a dinner party or simply as a treat to share amongst friends. Grease or line a muffin tin or preferably use a silicon muffin tray to make the cheesecakes easier to remove. Chop the Nakd bars in a food processor or high powered blender into small bits and divide them into 6 sections. Press firmly into the bottom of the muffin tins or silicon trays to make 6 cheesecake bases. Blend together the cashew nuts, agave nectar/maple syrup, coconut oil and vanilla until it makes a smooth silky mixture. Pour the mixture onto each of the cheesecake bases until it fills the top. 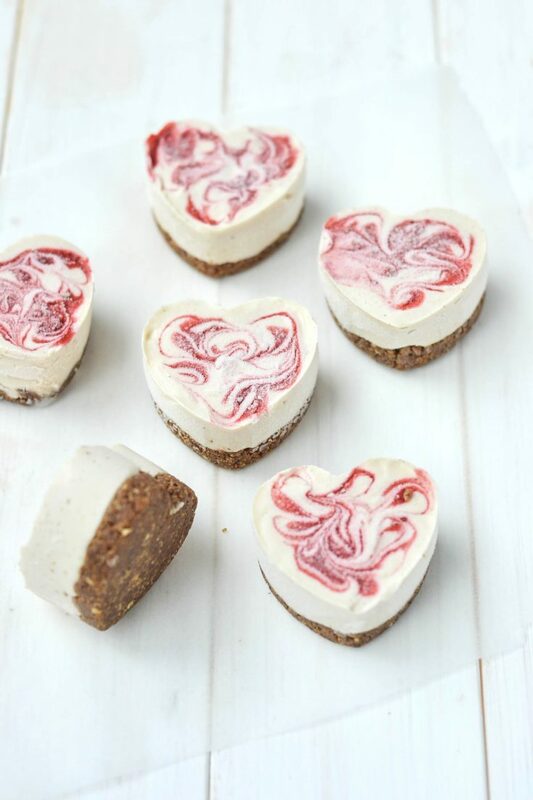 Make the strawberry swirl by blending together the dates and strawberries then dropping a few dots of the mixture onto the top of the cheesecakes. Use a skewer to gently swirl the strawberry mixture around. Sit at room temperature before serving and enjoy! 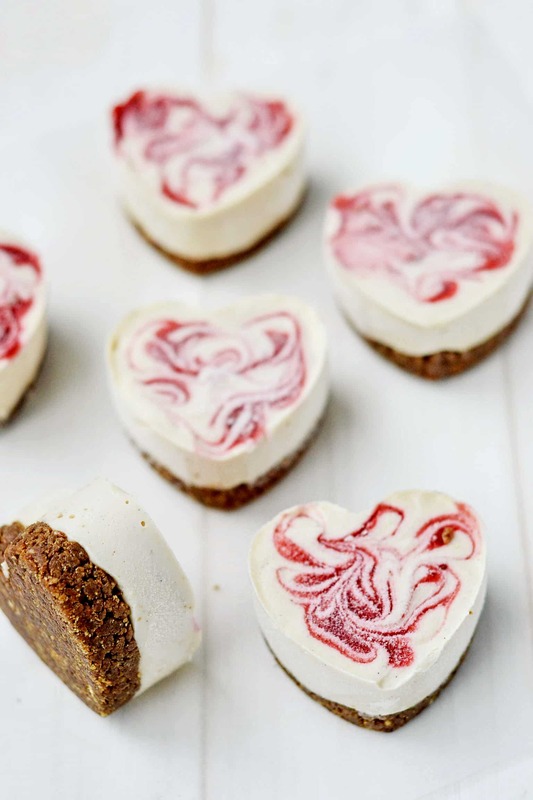 Those are the sweetest little cheesecakes. I could eat those all day long (if only). I love little treats like these. They're so much better than a great big dessert. These look absolutely gorgeous. I can't wait to try making them. I think they'd make a great treat during the day. Yours are so perfect, I wonder how I'll go trying to imitate those swirls! I bet they are delicious. Can I use honey instead of agave? Don't like using that & my hubby hates maple syrup! They look divine. Funnily enough I bought my first nakd bar today!!!! These look so gorgeous.